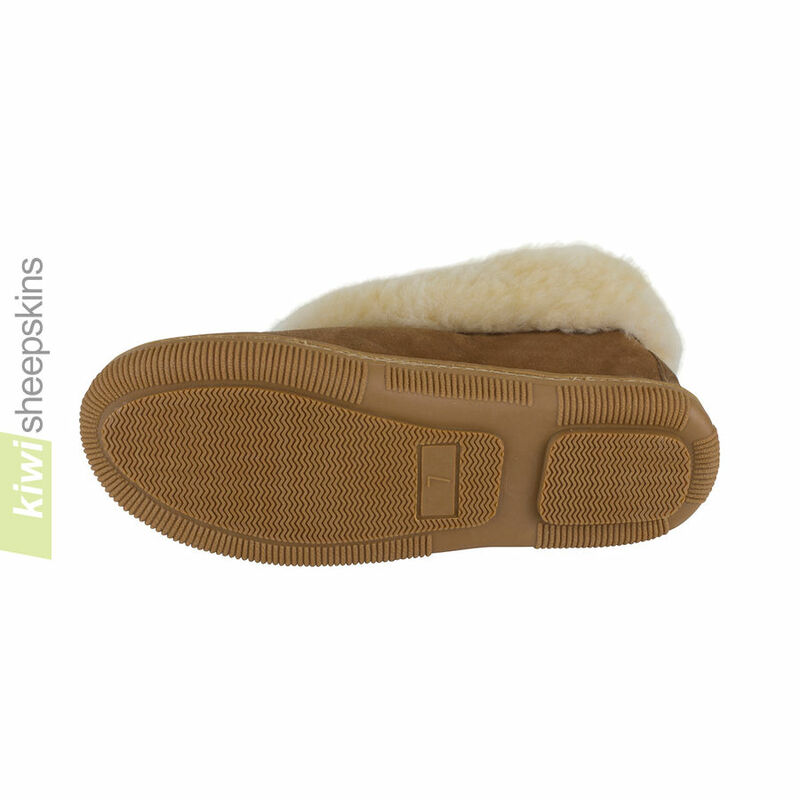 Genuine hard-sole New Zealand-made bootie style sheepskin slippers. 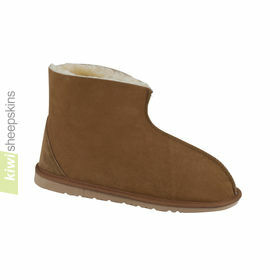 Crafted from premium quality twinface sheepskins for superior warmth and comfort, with a 12-month warranty. The side-stitched sole booties tend to run about true to size in women's sizes but slightly small in men's sizes. So for wide feet or if between sizes, you may need to go to the larger size. 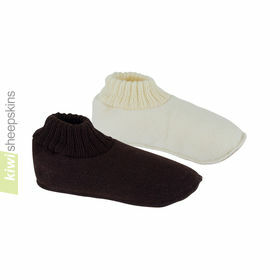 Comments from customers who have purchased these bootee slippers. Just to say thank you for another order just received from you. As ever, easy ordering through your great website. Items well packed and arrived in perfect condition. The booties are super comfortable, and are the 6th pair of slippers for 3 different family members ordered from you over the past 8 years. 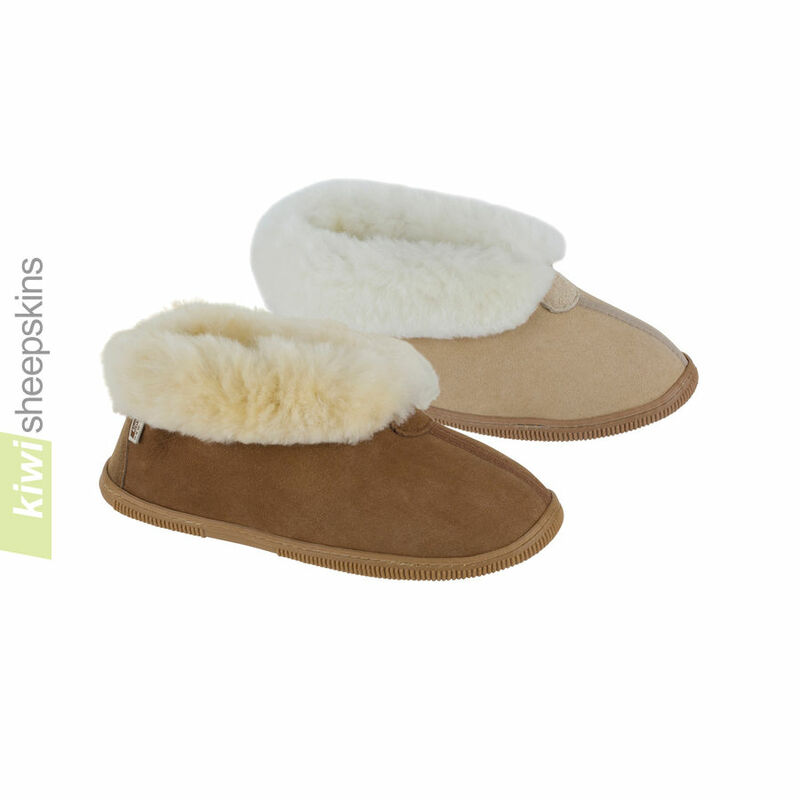 All pairs have been long lasting, easy to wear, and we wouldn't go anywhere else to buy sheepskin slippers. Best wishes to you all for the New Year from the Northern Hemisphere. Mr & Mrs B. S.
In 2015 my Mom received a pair of sheep skin slippers from a well-known and trusted US company and they lasted about 1 month before they began to separate at the seams and did not even make it a year before her toes were poking out the tops. I purchased your flexi sole booties item #FW016 as a Christmas present in 2016 to replace her very sad looking expensive slippers. She has been wearing these for over a month now and not only are they still just as nice looking as when she first put them on, they have been given the distinction of the being in my mother's own words, "the warmest slippers I have ever owned" and that means a lot in Upstate NY during the winter months. She initially wore them with socks as she doesn't usually like the lining in slippers but after a few weeks she stop with the socks and tells me not only are her feet "finally" warm but they never seem to get too hot or sweaty in these slippers. I am so happy I found you folks. Your slippers a quality product at a cost no greater than any of the others. I also really, really like the fact that the products are made in New Zealand. 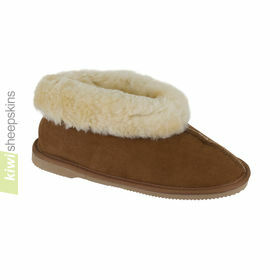 These are a fantastic slipper even on the coldest winter night and well worth the price. I just had to say that the slippers are beyond expectation in craftsmanship and comfort. Of course, I have already complimented you on your excellent service. It is so reassuring when retailers take an interest in their customers purchases and I very much appreciate your emails. I am so impressed that I will order from you in due course when members of my family require replacements slippers. Again, many thanks for your expertise in all areas of service and product. It is seldom found these days and you and your company must be recognised and congratulated for its high standards. I ordered a pair of your bootie slippers for myself for Christmas, and my feet have never been happier! I recently broke my leg, and this means that my left foot has poor circulation and grows cold easily. With these slippers, my feet are warm and comfortable, I absolutely love them! Before ordering, I phoned for some information, and received excellent customer service. I'll definitely be getting a pair of boots when I'm back on my feet! Thanks so much! I am writing to send a huge "thank you" to you! My order for slippers was shipped from New Zealand on the day that you received it, and was in my mailbox in Canada six days later - now on my (toasty warm) feet! I adore them - they are totally gorgeous! They are beautifully made and the sole wraps up onto the body far enough that I won't have to worry about destroying them if I need to wear them outside sometimes. Thank you so much for crafting such a lovely, classy product at a reasonable price - and for being so quick to ship. I already know what I'll be giving my family for Christmas this year! I absolutely love my bootie slippers. I have been wearing them less than a month, and they are so comfortable. I have a lot of metalwork (from surgery) in my left ankle which causes me ongoing discomfort, but since I have been wearing my booties with the cuff turned up, the pain has disappeared - a miracle! Thank you. The slippers have arrived... and do look really fabulous! Thank you. Your attention to my order and the way in which you answered my queries and questions was very much appreciated. 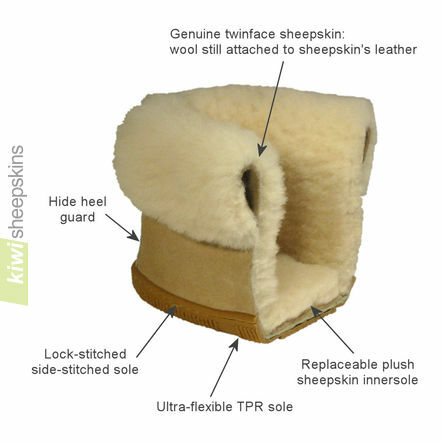 Kiwi Sheepskins is by far THE Best Company I have ever dealt with on-line for any product! Added to that - your products are of the highest quality - the look and feel of my new slippers is a delight! Thank you once again... 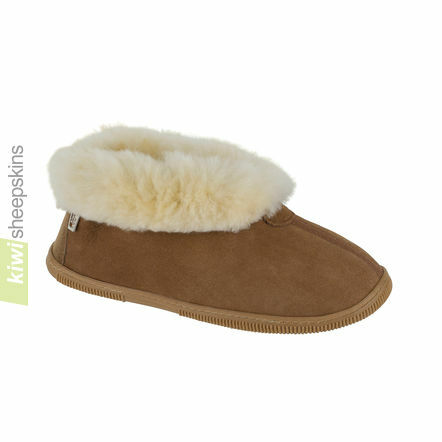 I will set about telling my Family and Friends about Kiwi Sheepskins again! Take care and keep up the excellent work! I just had to say what a wonderfully quick service provided to the UK. My bootie slippers are awesome. So well made and sooooo warm for the winter months. I will highly recommend you to family and friends. Well done Kiwi Sheepskins for providing such a brilliant product and delivery service. I received my two new pair of slippers yesterday. They're wonderful! Such soft, fluffy wool! A much better value than that well-known brand... And they arrived so fast! I don't think they could have gotten to me faster had I ordered them from the U.S. Once again, you've exceeded my expectations! Hello! I just wanted you to know how happy I am with my recent purchase. I ordered the Bootie Slipper which fit me very well, but I had a problem with the insole being a little too hard for my feet (I have a chronic pain condition). When I contacted customer service they responded right away with suggestions on how to fix the problem. I ended up purchasing a set of padded insoles. The customer service rep told the shippers to find a pair of insoles with just the right amount of padding for my situation. This was more personalized assistance than I was expecting, and it was a very nice surprise! 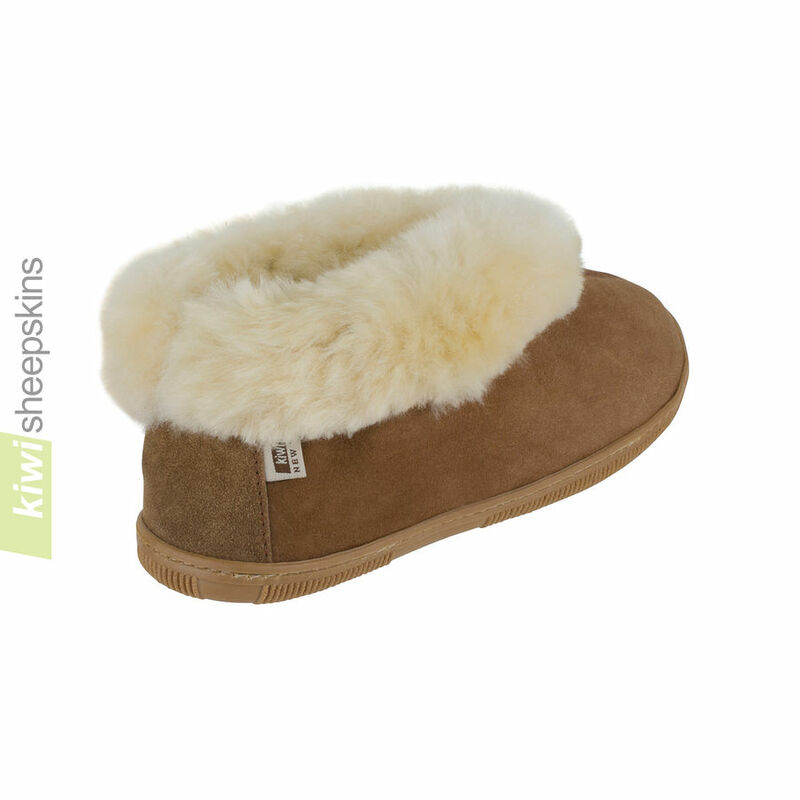 Thank you Kiwi Sheepskins! The slippers arrived and they fit perfectly. 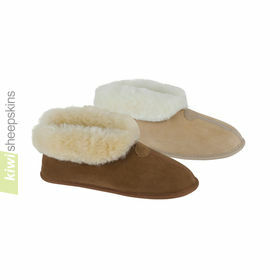 They are also some of the most comfy and warm slippers I have ever had, brilliant product and service. Thanks so much. I received my slippers last Tuesday and am so delighted with them, they are first class quality and you give a very good service so good I have just ordered another pair. It is just great to find a company that can find time to answer your question and that are willing to sell to the world. Keep up your good customer relations. Just to let you know my slippers arrived on the 3rd November. What service!! I am thrilled to bits with them (I live a very sheltered life) te - he. Once again thank you so much and I wish you all lots of luck for the coming future. Thank you so much for the prompt efficient delivery. I received my slippers today 9th October. Your customer service is second to none and the product is absolutely superb. I can honestly state I have never had slippers of such high quality. The price was also excellent and I have no doubts I will always order from you. My son had previously purchased a pair from your company and was very impressed, so believe me when I say, if you can please him you are definitely a company to deal with. Kiwi Sheepskin slippers were exactly what I wanted...they were very similar to my previous slippers, but are better quality. I ordered them on 25 Jan & received them today, 3 Feb...not bad coming from New Zealand to Colorado, USA. I like the service, & the shipping costs were part of the overall price. Thank you Kiwi. Many thanks to you, I received my slippers on Saturday less than a week after ordering them. Ironically I work for a footwear website in the UK and am impressed by the speed of your delivery. The slippers are very nice, lovely and warm. The best thing is that they don't make my feet hot and sweaty like the synthetic ones. I will be investing in a pair of the boots next. Just to confirm receipt of my slippers (received Saturday 13th Jan). Not only impressed by the slippers (just what the doctor ordered) but even more impressed by the service. If you need any customer recommendations please don't hesitate to use mine. Many Thanks. Very impressed with the product purchased. Very good value for money, and super speedy delivery. Would definitely use again and recommend to others. I would just like to say a big thank you, to you and the Kiwi sheep, for providing my slippers. They are the without a doubt the most comfortable slippers I have ever worn. A very good price for a very good product. I now know where to come for my friends & family's gift's. 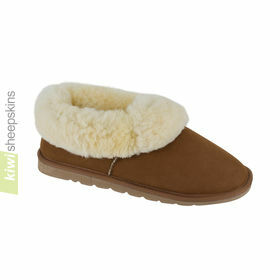 Very well made, and toasty warm, what more can one ask for from sheep skin slippers?